China's No.1 low-resolution interchangeable-cartridge handheld console, the Game King 2! 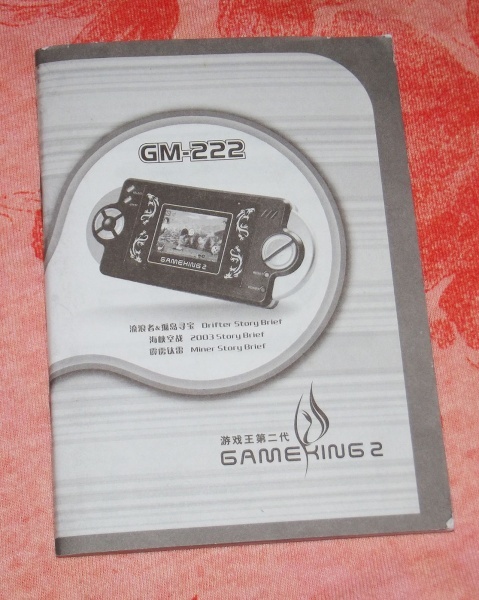 (游戏王第二代) The newest model GM-222, to be precise - this seems to be the only one that's still in production, and games are much harder to find, but the fact that it's still in production at all is pretty impressive considering this is a 10 year old obscure Chinese console format; if it lasts another few years it'll even have outdone the Game Boy (which was more or less discontinued the same year the Game King was released). On opening the box you're presented with the console and an overwhelming chemical smell (which I think comes from the cheap plastic tray more than the console itself). 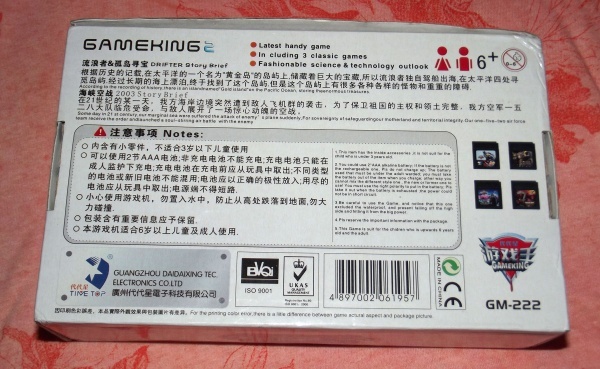 Hiding under the console is a manual printed in about ten different languages (and depicting a console with a dragon design around the screen which the actual thing doesn't have); here's a sample of the English version: "When the player bumps against the stone, the player's vitality red cesby 1 grade; The player's vitality is 0 when bumps against other enemies, or fall into thedeep ditch,;And the player loses one life . ." - I can't vouch for the other languages but I can tell you the Spanish version goes as far as to translate the name of the console as "Rey de Juegos", which was nice of them. 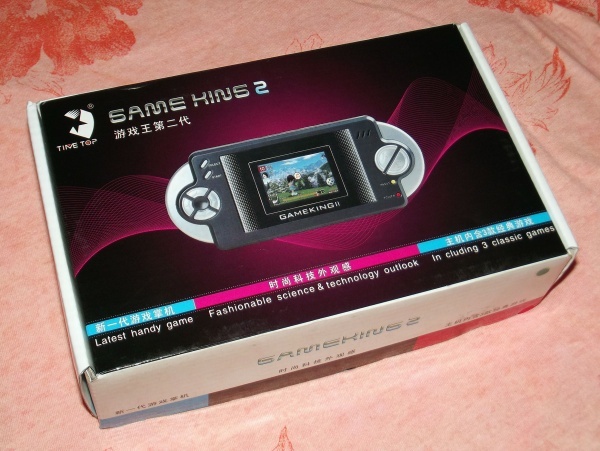 So here's the console itself - earlier versions of the Game King were quite obviously based on the GBA and PSP, but since then Timetop has moved more towards original designs, and here they've come up with something.. certainly original, anyway. 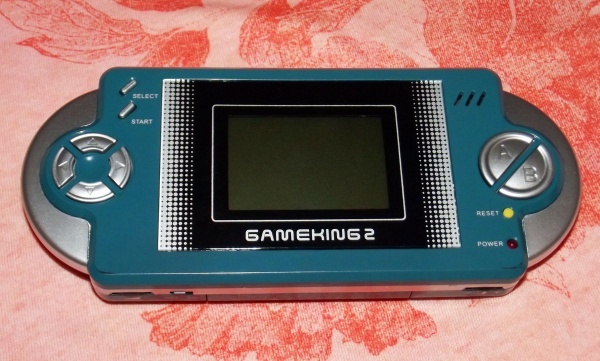 Despite being called a Gameking 2, this model doesn't have the frontlight (or fake colour backdrop) found in the previous PSP-lookalike Gameking 2, and instead reverts back to a non-lit screen in the style of the original Game Boys. 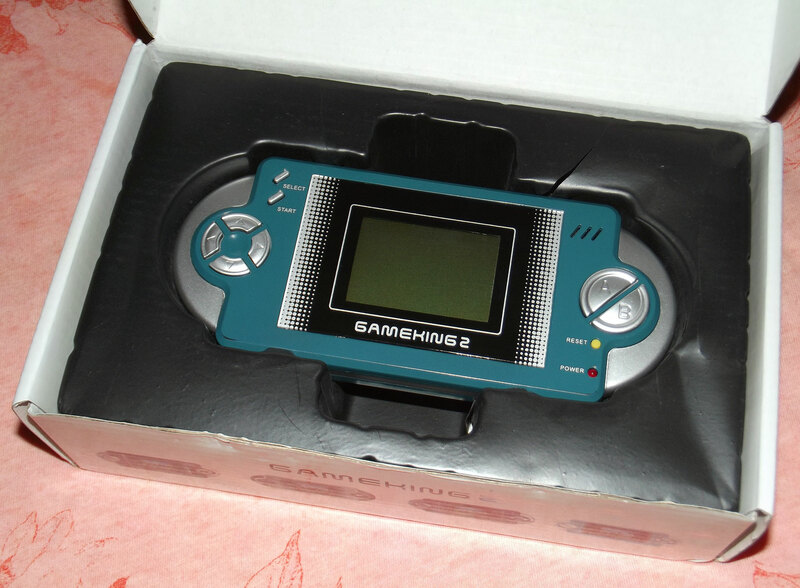 Unfortunately this particular version also has four separate buttons posing as a D-pad, which isn't the greatest. ...And the back - not much to look at here. Takes 2 AAA batteries which I assume will last forever in this thing. 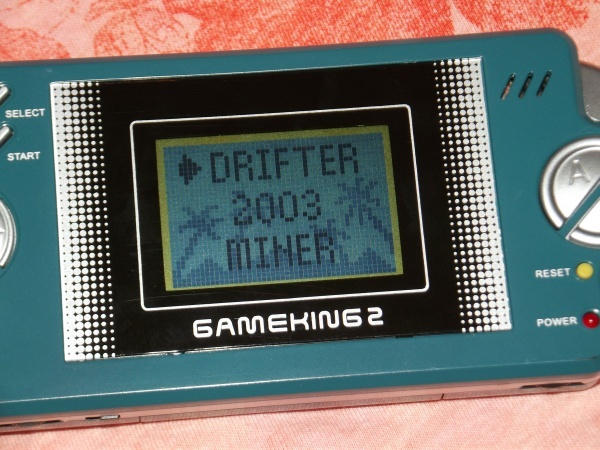 As you can see, the screen is very low-resolution, like an old mobile phone; every Game King comes with the same 3 built in games which I think have been reasonably well-documented elsewhere so I won't go into too much detail; basically Drifter is an Adventure Island clone (with Castlevania music), 2003 is a 1942 clone and Miner is a Bomberman clone. Originality isn't really their strong point. I have no idea who actually developed these games, whether Timetop did them in house or what, but they're reasonably well-done given the graphical limitations. Anyway, that's it for the console, but I also have three multicarts for this thing, so more Game King to come! I own a GM-219D, which has the same three games. 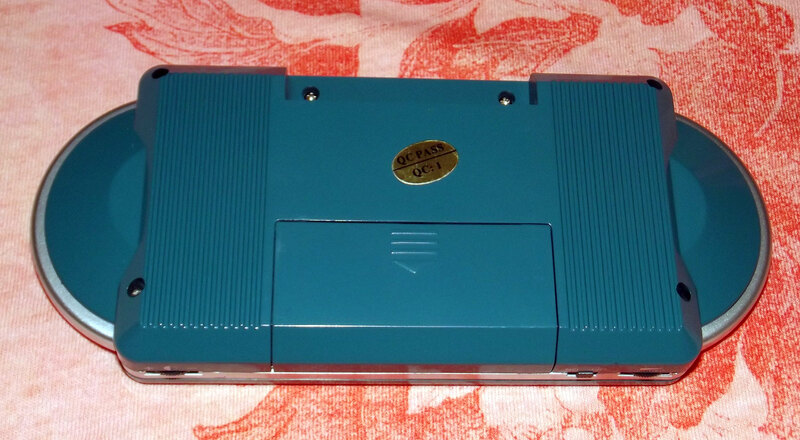 Also a multicart which contains Hawk (Choplifter), Trojan (Mega Man), Super Motor (dunno) and Happy Ball (Lode Runner).